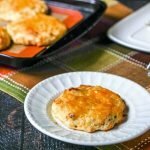 Low Carb Bacon Cheddar Scones - easy grab and go gluten free breakfast! If you are looking for a grab and go, savory low carb breakfast look no further. These low carb bacon cheddar scones take only 20 minutes to make and are gluten free. Each scone only has 3g net carbs! In a large bowl, add beaten egg, heavy cream, sour cream and 1/2 cup of the cheddar cheese. In another bowl, mix the almond flour, coconut flour and baking powder. Pour into the wet ingredients and mix well. Fold in the bacon bits. Add a silicone mat or a piece of parchment paper to a cookie sheet. Spoon the dough onto the cookie sheet to make 6 scones. The dough is sticky and wet so just use your fingers to form the shape you want. Spoon a teaspoon or so on top with the remaining cheese.